There are currently 2 users and 1245 guests online. what an awesome looking fish! great photo. Awesome photo, love the colour of that fish! would scare the crap out of the goldfish in my pond (and the cat)!! Awesome! Don't get much bigger than that and great eating!! great pic, awesome looking fish!! That DOES look like a Goldfish on Roids. Ripper of a pic, how are those colours! Great capture!!! Not bad conditions either. 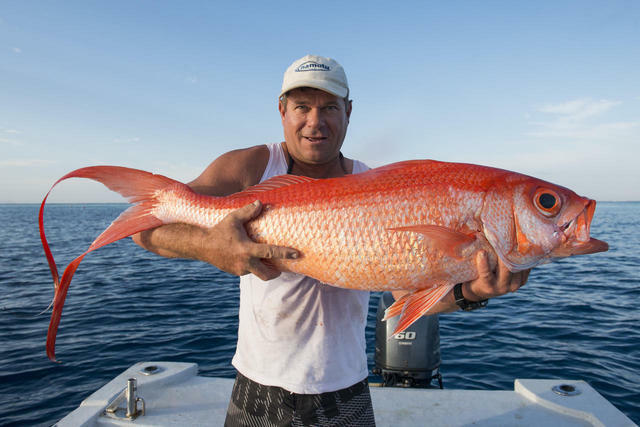 Where abouts in Fiji were you fishing? Appreciate your comments , I got it in approx. 250m ( caught four in total over 6 weeks) was catching Rubys quite regularly . It is called Onaga in Hawaii and is highly sought after for its eating Quality . I send 6 weeks to 3 months every year (for the last 15 years) fishing South of the Mamanuca Group of Islands in Fiji . Great pic. Not something you see everyday.